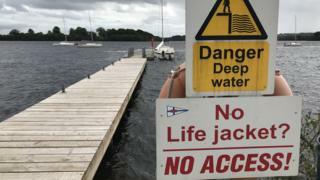 A coroner in Enniskillen has called for life jackets and flotation devices to be made compulsory on Northern Ireland's waterways. Joe McCrisken was speaking at an inquest into the drowning of an experienced boatsman in Fermanagh. Michael Beattie had been drinking alcohol which may have played a part in the tragedy. The former commodore of Lough Erne Yacht Club slipped and drowned in icy conditions. The coroner viewed CCTV footage which showed him struggling in the almost freezing water for almost two hours. He fell into the water in December 2017 while returning to his motor cruiser. Despite swimming 200m towards the shore and making it to land, he appeared confused. After sitting for an hour and a half, just 4.5m from his parked car, he fell back into the water. "He didn't realise where he was or how close he was to making it from the position he was in," the coroner said. His body was discovered under a pontoon the following morning. The inquest found he died from drowning as a result of cold water immersion and hypothermia. A police officer and RNLI volunteer Wayne Robinson told the inquest that drowning happens much faster in fresh water than in salt water. He said that while flotation devices must be worn on the water in the Republic of Ireland, there was no legislation to make them compulsory in Northern Ireland. "It is my belief that a life jacket or flotation device should be mandatory here," he told the coroner. The coroner added he would echo that view. "County Fermanagh has some of the most tranquil and beautiful waterways in the world, but water has inherent dangers," he said. He described the death of Mr Beattie as a "tragedy" which "underlines how a momentary slip in concentration can have devastating consequences".